I've read books where cricket and the genre are mixed, and not come out well. 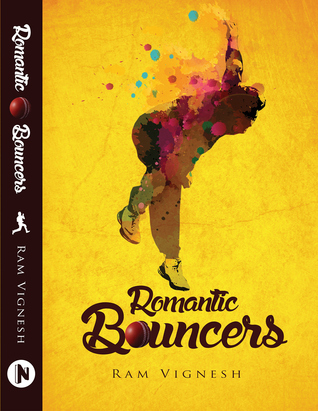 The impression that Ram Vignesh's Romantic Bouncers gave from the blurb was that it would be worth the read. It promised not just a story in the cricketing world, but also a romance and a thriller. A small part of me still wondered if mixing so many aspects would muddle the story and the impact that it makes. Rabin is an aspiring cricketer. His dream is to be part of the Indian National team. As is the dream of his best friend Sarath. But they know that's not going to be easy. The romance angle brings in Kristina, who studies in the same college. Any aspiration of such levels usually has an antagonist. That is his father. And such a dream will also a silent supporter, who is Bharaga. The story follows the aspiration of Rabin, and the journey towards that, while bringing twists and other characters into and around that. The mix of so many things - romance, mystery, family drama, cricket etc. - would usually be a bit difficult to read, and to be honest, at times, it does feel like that, but the narration is steady, in a simple language, and doesn't make that feeling last long. I liked the characters what Ram Vignesh brings, especially the silent supporter Bharaga and of course Rabin, the main protagonist. It has enough essence to keep the reader engaged. I'm slightly miffed that though characters were introduced well, two of them did not quite appeal to me. Kristina's character in the book doesn't work that well, and probably because she's shown as dead first, and then the reader taken back in time. And, though I cannot tell why exactly, the character of Hoariest Bung didn't quite make an impression on me either. The novel is not one that everyone will enjoy, but it's worth trying. I'm looking forward to more from Ram Vignesh, and will see if I can procure a copy of his earlier book. (Review dated 31/12/15 to match as per my marking on Goodreads).